Lithograph of the family of Queen Victoria. 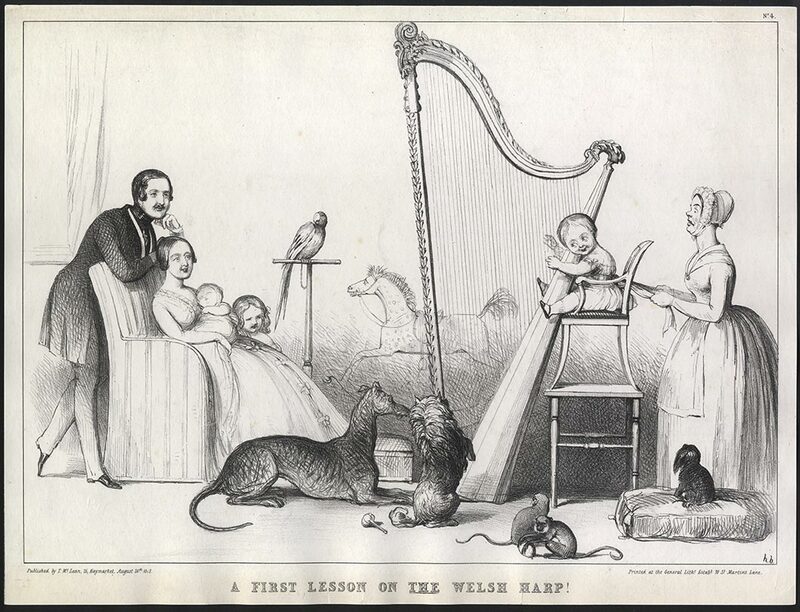 Satire of the Royal family, with Queen Victoria and Prince Albert seated with the Princess Royal and Princess Alice, watching the infant Prince of Wales play on a large harp. Edward VII, pictured on a chair perched on a table, is held onto the high chair by a concerned female attendant, below, the family's pets, Lorie the Parrot, and Eos and Islay the dogs, join the party watching the Prince perform. With English inscription below, including publisher's address, 'Published by Thos: McLean 26 Haymarket, August 24th 1843. Lithographie sur papier blanc uni.